Last night TapHappyAdventures went on our first ever expedition to Alewife in Long Island City. They hosted a momentous event, a Barrier Brewery tap take over. Barrier brought their A game with 30 beers and 2 casks, including one that was brewed specifically for another bar (don’t worry, they gave the ok to bring it, I’m sure.) The list had a little something for everyone but leaned heavily on hoppiness, which I would say is their signature. We got there with the intention of getting a couple flights to maximize the amount of beers we could try. Sadly, the bartender informed me that Alewife doesn’t do flights. After our initial disappointment we just moved on to full pint flights, real man type stuff. We were not disappointed. 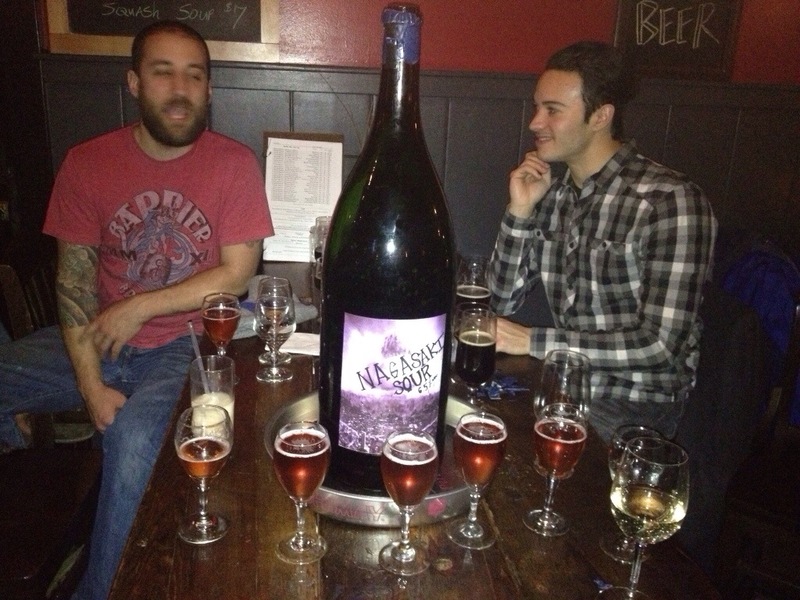 Last night we sampled a solid list of beers. Since it was cold and rainy here in NYC we started off with something dark and delicious and later moved onto lighter fare, although we avoided the hoppy beers. We had Moochelle Milk Stout, Rip Rap Baltic Porter, Saazsquash Butternut Squash Ale, Simple Lager, Dementor Sour Ale, and the coup de gras, Nagasaki Sour Saison. 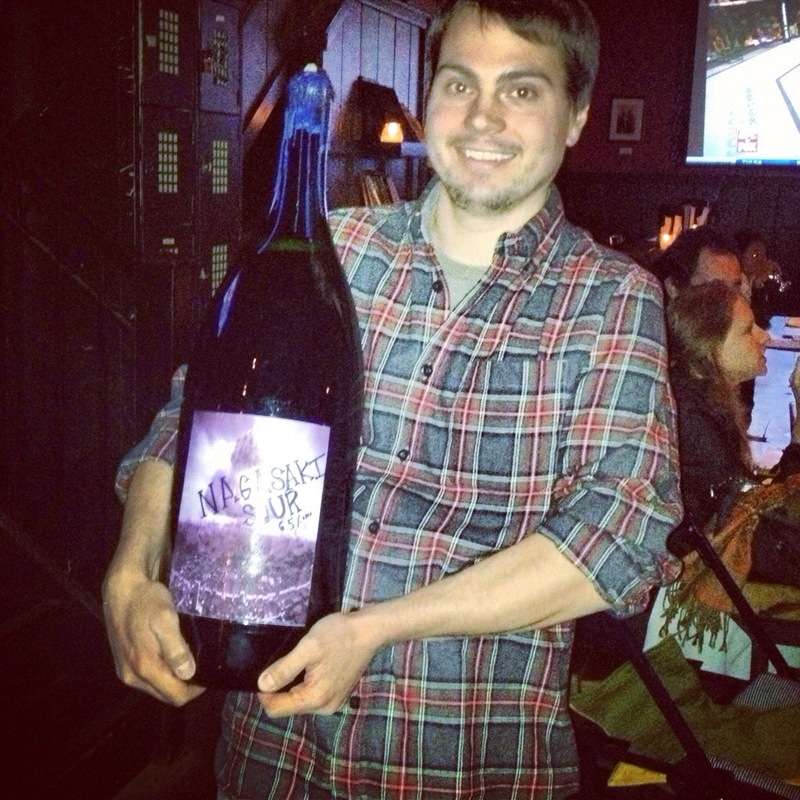 The Nagasaki Sour was poured from a ginormous 3 foot tall bottle by the brewers from Barrier around 10pm. In the spirit of the holidays they lined up glasses, popped the cork, and poured it for all to share as a thank you for coming and supporting the Barrier cause. All in all it was successful event with great turn out in support of one of our favorite breweries in the area. Much love to Barrier and good vibes for many more in the future. For more info on our ratings and thoughts on the beers we had check us out on Untappd and for pictures from the evening check us out on Instagram or Tumblr.